You may find yourself in a situation where a Berkeley Internet Name Domain [BIND]-based DNS system, such as those used on many variants of UNIX or Linux, needs to be migrated to a Windows Server 2003-based DNS infrastructure. In such instances, there are a number of approaches you may take in order to achieve a successful migration, this article will describe the Notepad migration (append) method. This article assumes that you’re familiar with your BIND (Berkeley Internet Name Domain) server infrastructure and can perform the required actions, or can refer to someone who is skilled in BIND operation without input from this article. This article assumes that you are familiar with the Windows Server 2003 platform; however most of the procedures will be step-by-step so you should be able to follow even if you have very little knowledge. 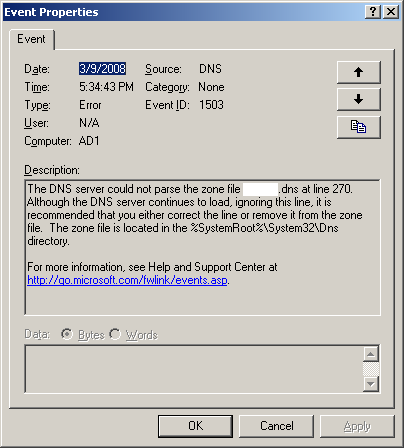 Manually merge the BIND DNS database file with the Windows Server 2003-based DNS file using Notepad - This article will focus on the procedures to handle this scenario, which may be required if you are not in a position to enable zone transfers on the BIND server, or are trying to work with a static file from a decommissioned server. Transfer the zone from the BIND server - This approach requires the least amount of configuration and is relatively straightforward. If you are in a position to enable zone transfers on your BIND server this is by far the easiest approach. You can read about it in How to Migrate BIND-based (UNIX or Linux) DNS to Windows Server 2003 using Zone Transfers. Before we can migrate Berkeley Internet Name Domain (BIND)-based DNS from another server, we firstly need to install the DNS services on the Windows Server 2003 machine. The procedures to install DNS have been covered in one of our previous articles, please reffer to to How to Install and configure a Windows Server 2003-based DNS Service. 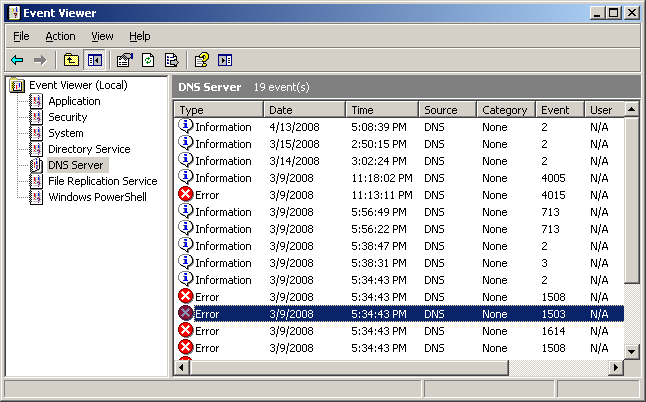 On your Windows Server 2003 DNS server open the DNS management console, by clicking Start > Run... > in the Open textbox type dnsmgmt.ms and click OK. The DNS MMC should open. On the General tab, click the Change button next to the Type field. Uncheck the Store the zone in Active Directory (Available only if DNS server is a domain controller). You should find a file called tmp.local.dns. This file is a text version of your DNS database and we need to back it up in case we need to restore it in the future. We must now cleanup the BIND file of any non Windows DNS entries and special characters. These can potentially cause numerous errors during the import procedure. Next we need to clean up the header information in your BIND DNS file. Actually, we need to remove all references to the BIND DNS servers which are included in the header. To clean the header delete at the start of the file stopping only before the first DNS entry. As in the following example image, you can safely delete the selected text. 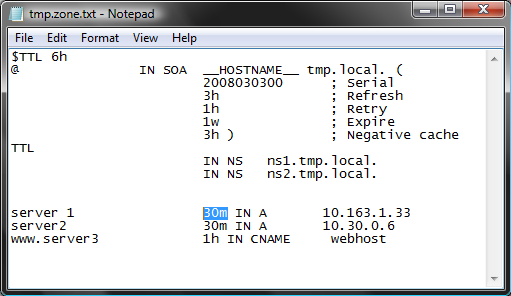 Open your newly created tmp.local.dns file in notepad. Select the full contents of the cleaned BIND file and copy it to the clipboard. 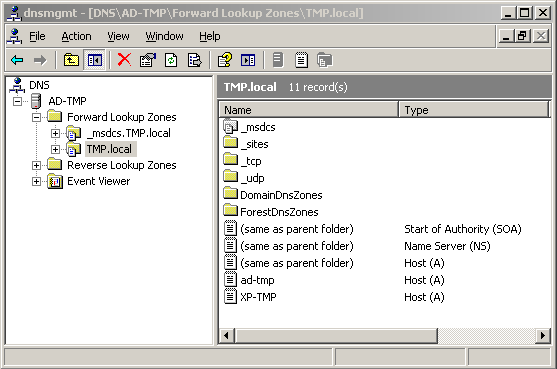 Change into the tmp.local.dns notepad window (your Windows DNS database file) and append (paste) the contents of the clipboard to the bottom of the file. 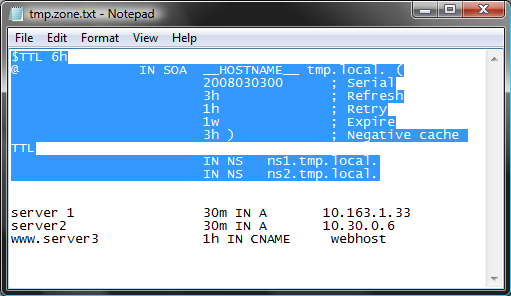 Start the DNS service, by running net start dns in the command window. At this stage you should go into the event log viewer and inspect the DNS logs for any import errors. Click on Start> Run and type eventvwr.msc and click OK. 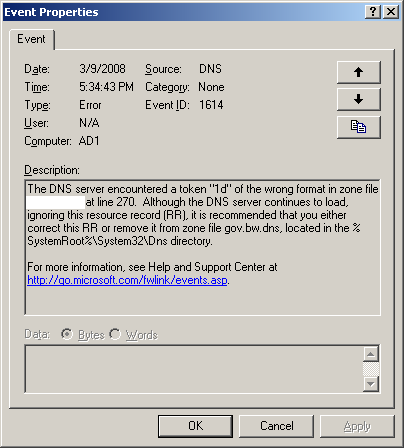 When the event viewer opens, navigate to the DNS events branch. If there are any erroneous entries, instead of failing completely, the service ignores the erroneous lines. It is quite important to ensure that you don’t have any errors in the DNS Event Log if you don’t check it, you may be missing critical entries in your DNS and the migration will not be successful. This article has shown how we can easily migrate BIND based DNS from unix or Linux to a Windows Server based AD-Integrated DNS configuration.